Previously, I talked about using the list monad to search the breadth of the solution space. What would you do if you won a lottery? Would you buy a sports car, drop your current job, and go on a trip across the United States? Maybe you would start your own company, multiply the money, and then buy a private jet? The input is some amount of Cash, and the output is a brand new Car and the leftover Cash (not necessarily a positive number!). You can combine smaller plans to make bigger plans. For instance, you may use the leftover cash from your car purchase to finance your trip, or invest in a business, and so on. What does all this daydreaming have to do with the solution to our puzzle? I mentioned previously that we needed to keep track of state, and this is how functional programmers deal with state. Instead of relying on side effects to silently modify the state, they write code that generates plans of action. An imperative programmer, on the other hand, might implement the car-buying procedure by passing it a bank object, and the withdrawal of money would be a side effect of the purchase. Or, the horror!, the bank object could be global. In functional programming, each individual plan is a function: The state comes in, and the new state goes out, paired with whatever value the function was supposed to produce in the first place. These little plans are aggregated into bigger plans. Finally, the master plan is executed — that’s when the actual state is passed in and the result comes out together with a new state. We can do the same in modern C++ using lambdas. You might be familiar with a similar technique used with expression templates in C++. 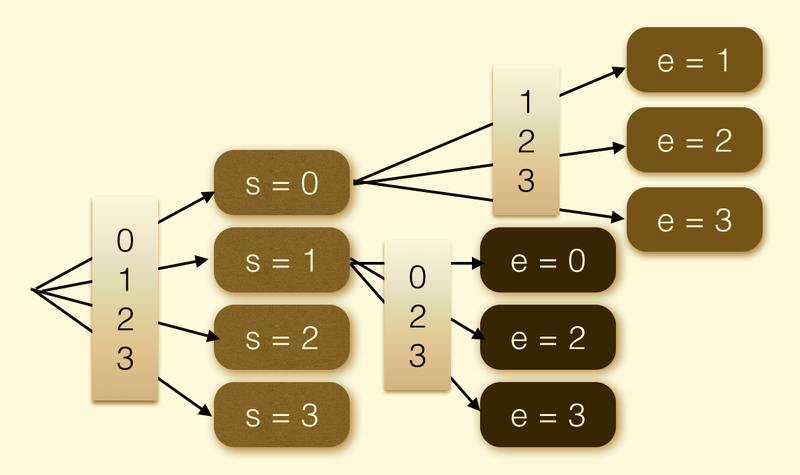 Expression templates form the basis of efficient implementation of matrix calculus, where expressions involving matrices and vectors are not evaluated on the spot but rather converted to parse trees. These trees may then be evaluated using more efficient techniques. You can think of an expression template as a plan for evaluating the final result. To find the solution to our puzzle, we will generate substitutions by picking digits from a list of integers. This list of integers will be our state. We will be using a persistent list, so we won’t have to worry about backtracking. Persistent lists are never mutated — all their versions persist, and we can go back to them without fearing that they may have changed. We’ll need that when we combine our state calculations with the list monad to get the final solution. For now, we’ll just consider one substitution. You may recall from the previous post that the essence of every monad is the ability to compose smaller items into bigger ones. In the case of the state monad we need the ability to compose plans of action. For instance, suppose that you know how to generate a plan to travel across the United States on a budget, as long as you have a car. You don’t have a car though. Not to worry, you have a plan to get a car. It should be easy to generate a composite plan that involves buying the car and then continuing with your trip. Notice the two ingredients: one is the plan to buy a car: Plan<Car>. The second ingredient is a function that takes a car and produces the plan for your trip, Plan<Trip>. This function is the continuation that leads to your final goal: it’s a function of the type Plan<Trip>(Car). And the continuation itself may in turn be a composite of many smaller plans. So here’s the function mbind that binds a plan pl to a continuation k. The continuation uses the output of the plan pl to generate another plan. The function mbind is supposed to return a new composite plan, so it must return a lambda. Like any other plan, this lambda takes a state and returns a pair: value, state. We’ll implement this lambda for the most general case. The logic is simple. Inside the lambda we will have the state available, so we can run the plan pl. We get back a pair: the value of type A and the new state. We pass this value to the continuation k and get back a new plan. Finally, we run that plan with the new state and we’re done. return runPlan(plB, ps.second); // new state! Notice that all this running of plans inside mbind doesn’t happen immediately. It happens when the lambda is executed, which is when the larger plan is run (possibly as part of an even larger plan). So what mbind does is to create a new plan to be executed in the future. Using getState you may examine the state when the plan is running, and dynamically select different branches of your plan. This makes monads very flexible, but it also makes the composition of different monads harder. We’ll see this in the next installment, when we compose the state monad with the list monad. The second helper function is used to modify (completely replace) the state. It doesn’t evaluate anything useful, so its return type is void* and the returned value is nullptr. Its only purpose is to encapsulate a side effect. What’s amazing is that you can do it and still preserve functional purity. There’s no better example of having your cake and eating it too. Persistent list method popped_front returns a list with its first element popped off. Typical of persistent data structures, this method doesn’t modify the original list. It doesn’t copy the list either — it just creates a pointer to its tail. Notice that we are using the same plan sel twice. But when this plan is executed inside of our final plan, it will return two different elements from the input list. When mbind is run, it first passes the state (the list of integers) to the first sel. It gets back the modified state — the list with the first element popped. It then uses this shorter list to execute the plan produced by the continuation. So the second sel gets the shortened list, and picks its first element, which is the second element of the original list. It, too, shortens the list, which is then passed to mreturn, which doesn’t modify it any more. We are still not ready to solve the puzzle, but we are much closer. All we need is to combine the list monad with the state monad. I’m leaving this task for the next installment. This time I didn’t rename mbind to for_each and mreturn to yield. Now that you’re familiar with the state monad, you may appreciate the fact that the same sel passed as the argument to mbind will yield a different number every time, as long as the state list contains unique digits. I know what you’re thinking: Why would I want to complicate my life with monads if there is a much simpler, imperative way of dealing with state? What’s the payoff of the functional approach? The immediate payoff is thread safety. In imperative programming mutable shared state is a never-ending source of concurrency bugs. The state monad and the use of persistent data structures eliminates the possibility of data races. And it does it without any need for synchronization (other than reference counting inside shared pointers). I will freely admit that C++ is not the best language for functional programming, and that monadic code in C++ looks overly complicated. But, let’s face it, in C++ everything looks overly complicated. What I’m describing here are implementation details of something that should be encapsulated in an easy to use library. I’ll come back to it in the next installment of this mini-series. Implement select from the example in the text using getState and putState. Implement evalPlan, a version of runPlan that only returns the final value, without the state. Implement mthen — a version of mbind where the continuation doesn’t take any arguments. It ignores the result of the Plan, which is the first argument to mthen (but it still runs it, and uses the modified state). I’m having a little problem understanding how the “final solution” works. If the initial state list was [0, 1, 2, …, 9], I can see how s can be 0, but I am failing to see how s will take on the values 1, 2, …, 9. Something very basic I am missing. Would you mind elaborating on this. Could you be more specific? I’m not sure which part you’re referring to. and just picks the first item in the state list, then at A, I cannot figure out how s is cycling through all the digits. I am stuck on the fact that s only does the first digit on the list and does not cycle through the others. This “cycling” mechanism is what I am missing. This function does two things: it pops the first digit, but it also returns the tail of the list–that’s what popped_front does. This tail is passed to the next function–the continuation (see the implementation of mbind). is quite different than the one listed on the blog page, which I incorrectly associated with the MoreMoney algorithm. The version of select() in the .cpp file above is as I would expect – it returns a PairList of every combination of a list entry and a list of everything else. This now makes sense to me. I really want to get into this, so I am going to try to clone the gitt repo and see if I can build and run it – I have Ubuntu 18.04, so I hope that the gcc version in 18.04 (pretty much the latest ubuntu release) will support c++17.